Anxiety is a common mental health condition, which will affect as many as 1 in 4 people at some point during their life. There are times when it is normal to feel anxious, for example before a test or a job interview, but when this continues over a longer period it can seriously interfere with your quality of life. Anxiety has strong links with a number of other physical and emotional issues including chronic stress, depression, insomnia and digestive disorders. It can be treated using medications such as antidepressants. However, these can cause unpleasant side effects and many people prefer to manage their anxiety naturally. One way of doing this is with earthing. This is the practice of bringing the body into conductive contact with the earth. The benefits of earthing regularly include stress relief, improved mood and better sleep quality and duration. It offers a method of anxiety and stress relief that is both safe and natural. There are many different reasons why people suffer from anxiety. There may be a genetic factor, meaning that if a close relative suffers from anxiety, you are more likely to as well. Being under constant pressure or exposed to prolonged stressful events can also trigger anxiety. Other things that may lead to anxiety are chronic illness, drug or alcohol abuse and childhood trauma. Some people simply have a personality which is more prone to experiencing anxiety. Anxiety is closely linked to stress. This is thought to be due to negative emotions’ effects on various biological systems. This includes the hypothalamic-pituitary adrenal (HPA) axis. The HPA axis is part of the sympathetic branch of the autonomic nervous system. It is involved in our “fight or flight” response to stress. It controls the release of the stress hormones adrenaline and cortisol. When these hormones are released, heart rate increases, blood is diverted to the muscles and blood sugar levels increase, providing extra energy. Other systems such as the immune system and digestive system are suppressed. All of this prepares us for action in the face of danger. Once the danger has passed, the sympathetic nervous system should switch off and adrenaline and cortisol levels should fall. The parasympathetic nervous system then kicks in allowing functions such as digestion to resume. This is controlled by the vagus nerve, and vagal tone is often used as a measure of autonomic nervous function along with heart rate variability. In an ideal world, the sympathetic and parasympathetic branches of the autonomic nervous system should be in a state of balance. However, chronic stress can lead the sympathetic branch to become hyperactive. When the sympathetic nervous system does not switch off, levels of adrenaline and cortisol become imbalanced. In the short term, levels can be higher than normal, but over longer periods, the HPA axis is suppressed causing them to fall. This 2010 research study found that morning cortisol levels were lower in patients suffering from anxiety. This finding was supported by a large population-based study carried out in 2012. As well as lowered cortisol levels, researchers found raised levels of the pro-inflammatory chemical interleukin-6. This suggests that there may be a link between anxiety and inflammatory disease. There is also a strong relationship between sleep and anxiety. People who suffer from anxiety have been shown to sleep less and lighter than non-anxious individuals. The stress hormone cortisol should follow a natural cycle throughout the day. It should peak at around 8am and reach its lowest levels around midnight, allowing a natural sleep-wake cycle to occur. This cycle can be disrupted, for example due to chronic activation of the HPA axis by stress. This can result in symptoms such as inability to fall asleep, waking during the night and daytime fatigue. The low morning cortisol levels found in anxious people is just one sign of dysfunction in this system, and could help to explain the link between anxiety and insomnia. The most common medicines for treating anxiety are antidepressants. These include selective serotonin reuptake inhibitors (SSRIs) such as fluoxetine (Prozac) and serotonin-noradrenaline reuptake inhibitors (SNRIs) such as venlafaxine (Efexor). There are also plenty of ways to relieve the symptoms of anxiety naturally. Making some simple lifestyle changes can help. Take plenty of exercise and eat a healthy, balanced diet. Include more foods which are high in nutrients such as omega 3 fatty acids, magnesium and B vitamins. Taking a probiotic may also help as anxiety has been linked to gastrointestinal inflammation. Reduce your intake of sugars and processed foods and keep caffeine and alcohol to a minimum. There are also many supplements which may help to relieve anxiety symptoms. Relaxation techniques such as meditation and breathing exercises can also really help. Try to keep a positive mindset as research has shown that positive feelings have a beneficial effect on vagal tone. Activities such as volunteering, keeping a diary, human contact and being kind to yourself can all help with this. Christopher Bergland suggests that by keeping your self-talk positive and challenging yourself in small ways to get out of your comfort zone can positively influence vagal nerve, and break negative patterns of behaviour. Therapies such as counseling and cognitive behavioural therapy are a good way to explore your feelings and learn coping strategies. Massage and acupuncture can both effectively relax the body and mind, and vagus nerve stimulation is another therapy which may help. 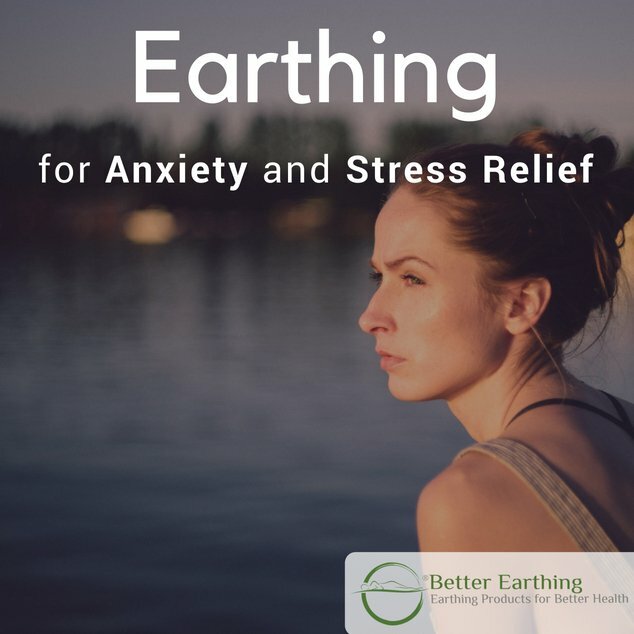 Another natural way to relive anxiety and stress is earthing, also known as grounding. This practice takes advantage of the earth’s subtle electrical charge to bring about a wide range of benefits, improving both physical and emotional well-being. The earth’s surface carries a negative electrical charge due to high numbers of free electrons being created by constant lightening strikes. When you bring your body into conductive contact with the earth, these act as powerful antioxidants, neutralizing free radicals and reducing inflammation. Earthing has the potential to reduce sympathetic nervous system overdrive, balance the autonomic nervous system and reduce the stress response. In addition, earthing normalizes cortisol levels, effectively resetting your natural, biological rhythms. This can help to improve sleep quality and quantity, boost daytime energy levels and bring about a more positive mood. Earthing can be done by simply walking barefoot on the surface of the earth, or using an indoor earthing product. This is a mat, pad or sheet interwoven with conductive fibres and connected to the earth via a wire and rod or through the earth port of your power outlet. These products provide a practical and convenient way to enjoy earthing on a daily basis and maximize its benefits. Find how earthing works in our article what is earthing. 28 healthy subjects were seated in a comfortable recliner with conductive pillows, mats, and patches for a two hour period. During this time they remained ungrounded for 40 minutes, followed by a 40 minute period of grounding and a final 40 minutes ungrounded. The most significant finding of the study was that skin conductance decreased within a few seconds of grounding, a sign of rapid change in the autonomic nervous system. The second study, carried out in 2011 (Chevalier, G. Sinatra, S.) was of similar design but looked at heart rate variability as a measure of autonomic nervous system function. It found that heart rate variability improved significantly during the grounded period, indicating improved vagal tone. A further 2015 study looked at the effects of earthing on mood. It took 40 subjects who were seated in a comfortable chair with conductive pillows, mats and patches and then either earthed or sham earthed for one hour. This 2004 study looked at the effects of earthing on cortisol profiles, sleep, pain and stress. Twelve subjects slept on conductive mattress pads in their own beds for eight weeks. They were all suffering from symptoms such as poor sleep, physical pain and emotional stress. The subjects had their cortisol levels measured at the beginning of the study and again after six weeks. It was found that following sleeping grounded to earth, most of the participants’ cortisol levels had normalized when compared to the initial readings. They also reported improvements in length and quality of sleep, reduced pain and less emotional stress. The easiest way to experience earthing is to go outside and walk barefoot on a conductive surface such as grass, sand or unpainted concrete. Within seconds you will feel your muscles relax as your nervous system is calmed. To maximize the positive effects of earthing, consider investing in an indoor earthing product. This will allow you to enjoy earthing’s many benefits on a daily basis, while you work, rest or sleep. Ghaly M, Teplitz D. ‘The biologic effects of grounding the human body during sleep as measured by cortisol levels and subjective reporting of sleep, pain, and stress’, Journal of Alternative and Complementary Medicine, 2004;10 (5): 767–776. Chevalier G. ‘Changes in pulse rate, respiratory rate, blood oxygenation, perfusion index, skin conductance, and their variability induced during and after grounding human subjects for 40 minutes’, Journal of Alternative and Complementary Medicine, 2010 Jan; 16 (1): 81-7. Chevalier, G. ‘The Effect of Grounding the Human Body on Mood’, Psychological Reports: Mental & Physical Health, 2015 116 (2): 534-42. Chevalier G, Sinatra S. ‘Emotional stress, heart rate variability, grounding, and improved autonomic tone: clinical applications’, Integrative Medicine: A Clinician’s Journal, 2011;10 (3).